What are the benefits of laser marking automobile parts? What automobile parts are most often laser marked? How does the automobile industry benefit from laser marking technology? To build the newest and best vehicles, car-makers establish and maintain a global supply chain that brings thousands of components to their manufacturing plants where they are pieced together by workers on an assembly line. With components sourced from around the world, it can become a challenge to keep track of where each component came from – especially in the event of a recall. When a defective car is reported by a customer, the manufacturer needs to know where the car was manufactured, what parts were defective, and where those parts came from. That need for traceability is exactly why laser marking parts is becoming so common in the automotive industry – there’s simply no better way to ensure that every part of a vehicle can be followed and tracked throughout its entire life cycle. With thousands of individual components coming together in each vehicle produced, laser marking technology offers car-makers a low-cost means of introducing traceability and flexibility into their manufacturing operation with a consistent and reliable process. Car manufacturers should be aware of the five key benefits of laser marking for automotive parts. Laser marking is a highly flexible technology that can be used to mark automotive parts with images, logos, any type of alphanumeric writing, dates, QR codes, barcodes, unique identifying numbers (UIDs), and virtually any other form of marking or symbol. That level of flexibility is a major reason why auto manufacturers choose laser marking over other types of physical marking or chemical etching. Laser marking can be done on flat, round or curved surfaces, making it equally simple to laser-mark auto parts of all shapes and sizes. Below, we’ll take a further look at the flexibility of laser marking in the automotive sector as we explore the various parts that manufacturers can choose to laser-mark. Product traceability is a major concern for automobile manufacturers – and for good reason. When a defect in a car is identified, a car manufacturer may have to recall every single sold vehicle to correct a defect. Some high-profile recalls have seen auto manufacturers recall hundreds of thousands or even millions of vehicles that were already sold to consumers. The manufacturer might have to replace or adjust a specific component to ensure that the vehicle was safe to operate. Traceable components can help lessen the impact of a recall by allowing the car manufacturer to more readily identify which cars might be affected. Each component can be marked with a UID that indicates where it was manufactured and which batch, or lot number, the product was a part of. If other components from that batch are later found to be defective, it is much easier for manufacturers to find other cars with components from the bad batch using traceability markings. With automotive laser marking, a car manufacturer can mark a vehicle component with a QR code that contains information about its batch and lot numbers. In the event of a recall, they could have customers simply scanning the QR code of the component to determine whether they need to bring the car in for service. This is much preferable to recalling millions of units due to one malfunctioning component that only affects some vehicles. The laser marking process uses a low-powered laser to discolor the material being marked, leaving a high-contrast marking that is permanent. At the same time, the material that receives the laser marking remains structurally integral and is all but unchanged by the process. Permanent marking capabilities are vital for the traceability of parts and are much preferable to labels and stickers that might simply peel off. Image: Caption: Lasers are effective for marking stainless steel, anodized aluminum, glass, rubber, silicon, plastic and other materials with permanent text and images that won’t fade away. Compared to chemical etching and other alternative technologies for marking automotive parts, laser marking provides a cost-efficient means of getting the job done. The inputs for laser marking a given object are the laser marking machine, the object itself, the electronic design for the marking and the electricity used to power the laser marking system. There are no chemicals to dispose of and no other waste products. The low cost, simplified process combined with high-quality markings make laser marking the most attractive option for marking automotive parts. In addition to being an efficient use of resources, laser marking integrates well with existing manufacturing practices in the automobile industry, where quality and consistency in processes is the focus of operations. 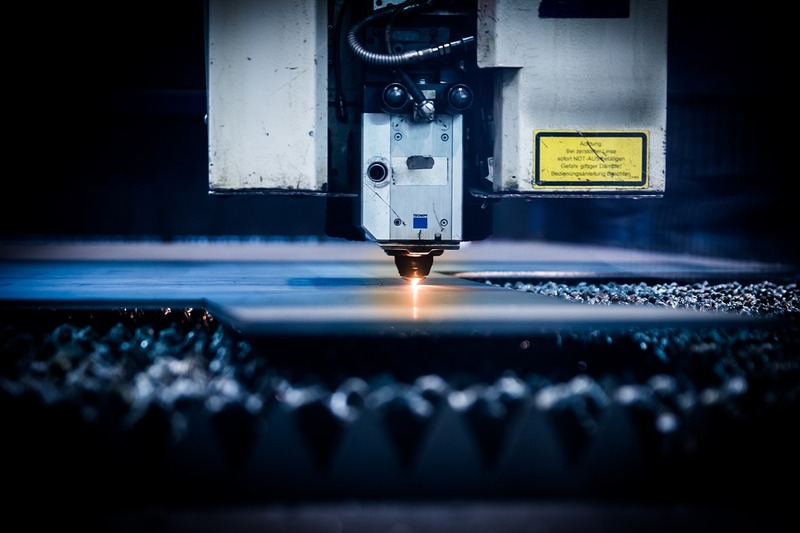 Laser machines offer extremely consistent output with high levels of repeat accuracy, especially compared to traditional cut-and-stamp methods or other conventional marking methods that can damage parts and lead to waste. Laser markings introduce an opportunity to increase automation through a high-quality process that rarely produces errors. Laser marking is extremely precise, meaning that equally clear markings can be produced on parts of any size. Whether you’re laser marking a full identification plate to sit on top of the engine, or marking the rubber on the hundreds of feet of electrical components that wind through the vehicle, you can expect the same level of quality and clarity from laser markings. Consistent quality in markings is one of the major factors that distinguishes laser marking from other forms of parts-marking in the automotive sector. What Automotive Parts are Marked by Lasers? Laser marking enables car manufacturers to add traceability markings to each part of a vehicle, but it can also be used to mark descriptive graphics, visual or textual instructions for the vehicle owner, or to communicate the regulatory conformance of the vehicle itself. Below, we highlight some of the key applications of laser marking inside, outside and under the hood of a manufactured vehicle. Looking around the inside of your car, it’s pretty easy to identify parts that have been, or could have been marked using a laser marking machine. From the small images on the instrument panel buttons that control the air temperature and configure your ventilation system to the letters and numbers alongside your gear shift lever, laser marking machines are used to produce high-contrast descriptive images that are easy to recognize and interpret despite their simplicity. Laser marking makes it easy to reproduce these images consistently, ensuring a crisp appearance and high level of detail in each vehicle. Along with the instrumentation panels, we can also think about the electrical components inside a vehicle. Cars that are manufactured today may have up to 50 embedded computer systems, controlling automated features like back-up cameras, lane swerve warnings, airbags, and more. Car makers can use laser marking to accurately label electrical components, making it easier for technicians to identify and correct maintenance issues in the future. Caption: In the modern vehicle interior, laser marking is used to produce clean labels that contribute to sleek and aesthetic feature design. Laser marking can produced high-definition letters and custom symbols for buttons of any size or shape. Components on the exterior of a vehicle are marked for a variety of purposes. Parts of the body may be marked with identification numbers or serial numbers, while the side mirrors can be marked with a pattern and textual instructions (objects in mirror are closer than they appear). Even the wiper blades can be marked with a model number and specifications, allowing a driver to easily identify the replacement product needed in the event that one breaks. In addition to laser marking components of the engine to ensure traceability, car manufacturers must produce and affix identification plates to each vehicle that include safety and identifying data. The vehicle identification plate, body identification plate and safety compliance plate are typically found under the hood of the vehicle, towards the back and above the engine. They indicate the manufacturer, serial number, the date that the vehicle was manufactured, additional information about the engine, color, trim and other data. The safety compliance plate affirms that the vehicle conforms to the applicable motor vehicle safety standards. Laser marking is the best way for car manufacturers to ensure that parts on their vehicles are traceable and identifiable throughout the supply chain. Car manufacturers who adopt laser marking benefit from a low-cost process that generates permanent, high-definition markings with low error rates and consistent accuracy. Automobiles are built from thousands of components, many of which can be laser-marked for traceability, aesthetics, or to communicate a message to the customer. Laser-marked parts can be found in the vehicle cabin, on the outside of the vehicle, and under the hood.